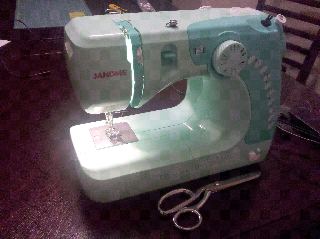 My new little backup sewing machine arrived on Friday. 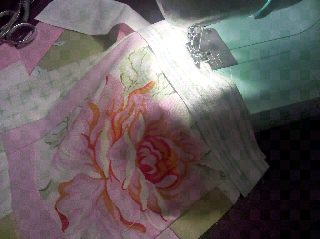 I decided to get the Janome Hello Kitty machine, and so far it's working great. It's a very basic machine, and I can't use my quarter inch foot from my other Janome on it, but I think I'll be able to figure out a solution to that. I also wanted to share a little sneak peek of what I've been working on. I'm probably not going to share the whole thing until it's been given to its owner. Hope your little girl and all of you adjust quickly. Moving is hard! It is a super sweet machine. Can you change the needle position? Hope this transition period is temporary and you can get into a real home soon! We miss you at guild. I am glad you are settling in. I am excited to hear about your new life in Seattle. I am happy that you were able to find a hello kitty sewing machine! I am glad you are getting to sew even though you are busy trying to find a wonderful place to live. Such a cute machine, Vicki! And the fun photo treatment just makes it look a little more retro and cool! 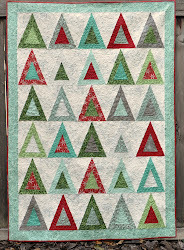 The fabrics in your project are gorgeous! I am not even kidding... just today I was telling my mom that I should get a Hello Kitty machine. I love my 'big' Janome and would love to have something small and portable for sewing days and if a friend comes over to sew. You'll have to give me the scoop on the quarter inch food solution!